Consumers are more curious and more demanding than ever before. They expect to get things done faster–engaging with ads that are uniquely relevant to them. In fact, 91 percent of mobile users bought or plan to buy something after seeing an ad they described as relevant.1 That means it’s critical for marketers to create a wider variety of ads that are diverse. Creating relevant ads at scale can be a challenge, and products like responsive search ads, responsive display ads, and Universal App campaigns can help. That’s why we’re introducing new insights to make it easy for you to create the ad experiences your customers expect. Responsive search ads combine your creativity with the power of Google’s machine learning to help you deliver relevant, valuable ads. To make it easier for you to create more effective responsive search ads, you’ll now be able to preview ad combinations as you build them. This shows you what your ads might look like, and you can even browse through them to double-check your work. You can also view reporting for headlines, descriptions, and top combinations to help you see what’s showing up most often on the search results page. Apartments.com is a leading online resource for home and apartment rentals. Using responsive search ads, the brand was able to create ads that were more relevant to people at key moments in the rental process. As a result, Apartments.com saw a 10 percent lift in clicks. ForRent.com, another brand in the Apartments.com network of sites, saw a 16 percent lift in clicks with a similar strategy. Innovations like responsive search ads can help you create relevant, personalized ads at scale. However, it can be a challenge to know when these ads have the right amount of information. That’s why we’re introducing ad strength. You’ll see ad strength both when you write a responsive search ad and as a column in Google Ads. Ranging from “Poor” to “Excellent,” this metric measures the relevance, quantity, and diversity of your ad copy. Combined with actionable feedback, ad strength makes it easy for you to improve the effectiveness of your ads. 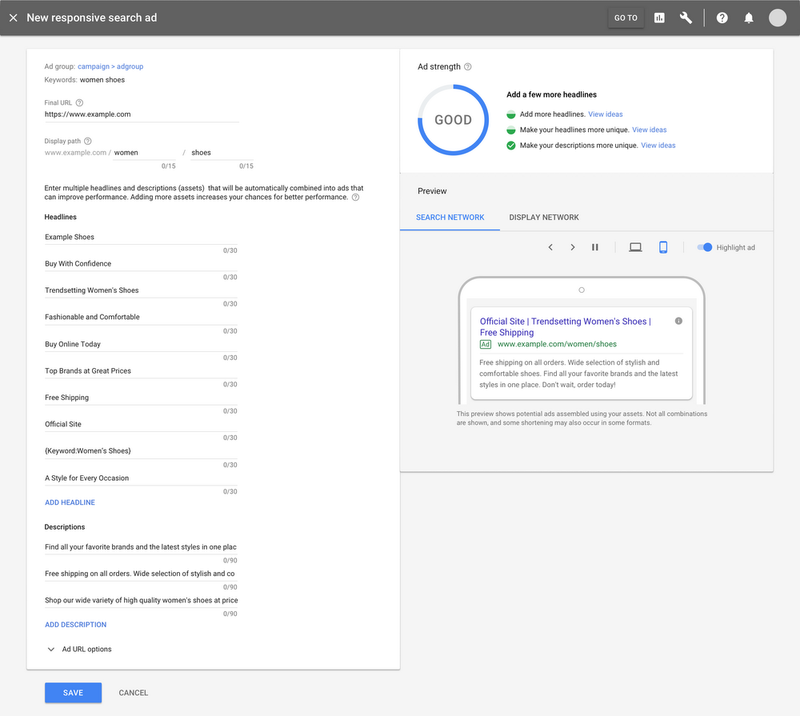 Ad strength will be available as a column starting in early September, and in the responsive search ad creation interface over the next several weeks. Support for responsive display ads will follow in the coming months. To get started with ad strength, we recommend providing as many distinct headlines, descriptions, and other assets as possible. This will help Google's machine learning generate a larger number of relevant, effective ad combinations. For a responsive search ad, provide as many headlines and descriptions as makes sense for your business. If you’re having trouble getting started, we recommend focusing on creating at least five headlines. For a responsive display ad, provide up to 15 images and five logos, headlines, and descriptions per ad. App marketers are also making the shift to more diverse creative. 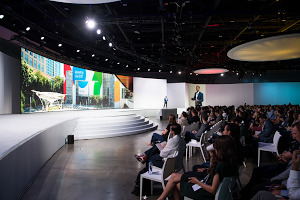 With Universal App campaigns, Google’s machine learning automatically combines your creative assets with content from your app store page to create personalized, relevant ads at scale. We recommend providing at least four to five text, video and image assets in varying lengths and sizes. If you’re looking for more guidance, we have an online course to help you design and optimize your creative for a Universal App campaign. If you want to learn more about promoting your mobile app in Google Ads, you can view the other courses at g.co/learnappads.